Ohio’s Jackson Place defends Chesapeake’s Matt Donovan (30) during the first half of Saturday’s showdown at Selby Stadium. After trading goals throughout regulation, Chesapeake’s Ben Rubeor scored the game-winning goal 28 seconds into overtime to give the Bayhawks a 12-11 win over the Machine Saturday at Selby Stadium. Greg Puskuldjian won the overtime faceoff for the Machine, but a push call on the scramble for possession gave the ball to Chesapeake which ultimately resulted in the Rubeor goal. Scott Rodgers stood strong in the goal for the Machine, but an improved Bayhawks defense in the second half slowed down the Machine offense, holding it to just three second-half goals. Ohio’s Peter Baum didn’t take long to get back in the swing of things, scoring the game’s first goal after missing the last three contests due to injury. After the Machine outscored the Bayhawks 3-1 in the first quarter, with Tom Schreiber and Marcus Holman joining Baum in the scoring column, the Bayhawks were able to come within one score midway through the second quarter. However, the Machine used its explosive offense, including a second goal from Schreiber with 36 seconds to play in the half, to expand its lead to three headed into halftime. The Bayhawks came out of halftime ready to fight back and after a penalty forced the Machine into a man-down situation. A Chesapeake goal with 3:45 to play in the third quarter tied the game at nine. The Bayhawks’ 4-1 run continued into the fourth quarter before Kevin Cooper found the back of the net for the Machine for the first time in over 15 minutes of play. 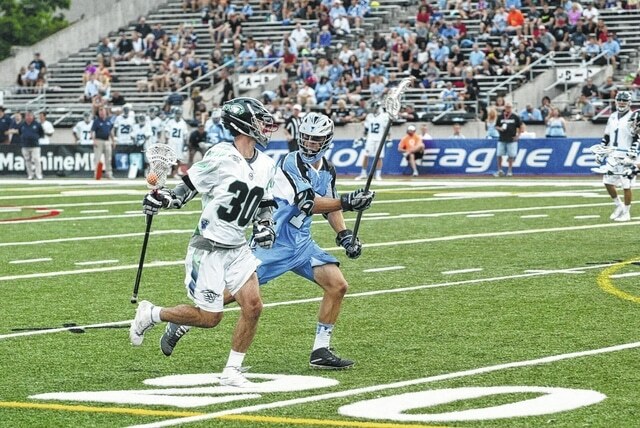 The Machine and Bayhawks scored two goals apiece in the fourth quarter. Kyle Harrison added the tying goal for the Machine with 2:43 to play in the fourth, forcing the game into overtime. The loss ends the Machine’s four-game winning streak. The Machine hits the road next weekend when it visits Rochester before returning to Selby Stadium on July 4 at 4 p.m.